that my mother bought me around 1970.
even in my early days. I still re-read them every-so-often. 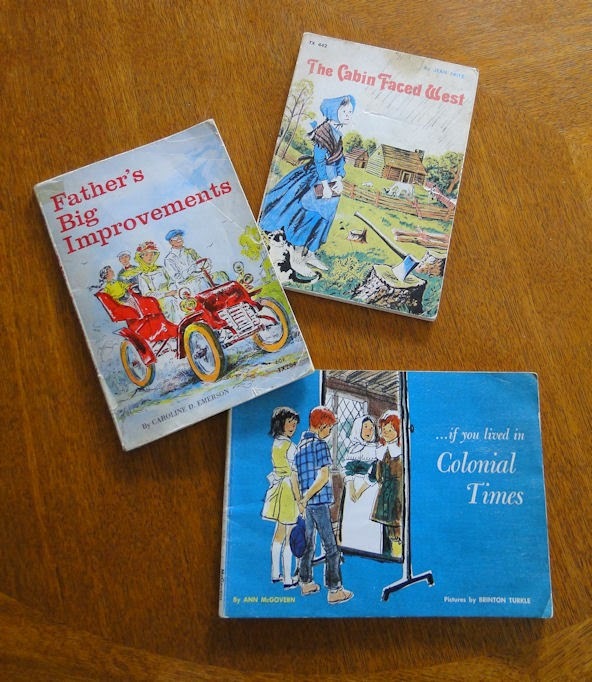 I have been collecting history for as long as I can remember, beginning way back when my age was still in the single digits and my mom would buy me children's history-oriented storybooks and Matchbox brand Model T cars. Throughout my teens and twenties I collected replicated period newspapers showing major events (the Hindenburg catastrophe or the start of WWII, for example). When I got married, my wife also had a thirst for history, and we have been quenching it together ever since, though now we collect the real deal: actual antiques (you can read about our antique penchant HERE). And I am proud to say I have never paid an astronomical amount for anything in our collection. In fact, I've gotten most of the items pretty darn cheap! But even though I collect these ancient pieces of Americana - nearly all from the 19th century - I still get replicas here and there. Why? Well, because, as I noted in THIS POST, sometimes the real thing is either too expensive or maybe even priceless. starter when friends come by. I have a rule, however, about collecting replicas: they must be as close to the original as possible, preferably exact; "close enoughs" are a rarity for me! As I recently began to become reacquainted with 18th century American history, I found myself wanting to have objects of that era as well. Now, if you know anything about antiques you will also know that, in general (with some exceptions), the older an item is, usually the more expensive it can be, so my 'real deal' 18th century antique collection is slim: my walking - or great - wheel is most possibly from the 18th century. And that's all we have for that time period. However, I do have some 18th century replicas in my house, including a Williamsburg mirror and a period wood candle box (I have a tin candle box as well, though I believe its style may be more turn-of-the-19th century). And the more I take part in Colonial/RevWar reenactments, the more authentic-looking 'fake' 18th century things I acquire. You may or may not know, but recently, at special events, I have been portraying Paul Revere, famed American patriot who made his famous midnight ride on April 18, 1775 to warn the residents of Lexington and Concord that the British Regulars were coming to try take their arms and ammunition. Revere's signal that the military march was to begin was to have lanterns lit in the Old North (Christ) Church tower ("I agreed with a Col. Conant, and some other Gentlemen, that if the British went out by Water, we would shew two Lanthorns in the North Church Steeple; and if by Land, one, as a Signal"). 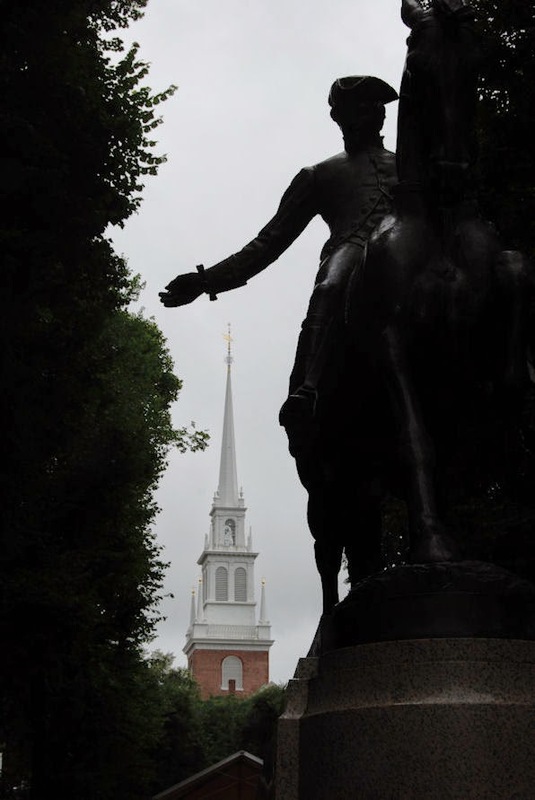 Of course, we know that two "lanthorns" (the archaic version of "lantern" of which Paul Revere evidently preferred) were shown in the church tower, and the Regulars were crossing the Charles River. Of those two lanterns, only one remains. At the time, little or no significance was placed on the lanterns used to send the momentous signals, as is often the case. For the preservation of the sole-survivor of the original pair, we have three people to thank. First is Robert Newman, sexton of Christ Church (Old North Church), who was a friend of Paul Revere's, and one of two people who climbed the 154 stairs that took them to the ladder to climb even higher into the steeple, the tallest marker in Boston at the time, to set the signal. Because Newman saved the lantern, I believe he may have had a sense of history about him. I have not found what happened to the second lantern. The second person to thank is Captain Daniel Brown of Concord. 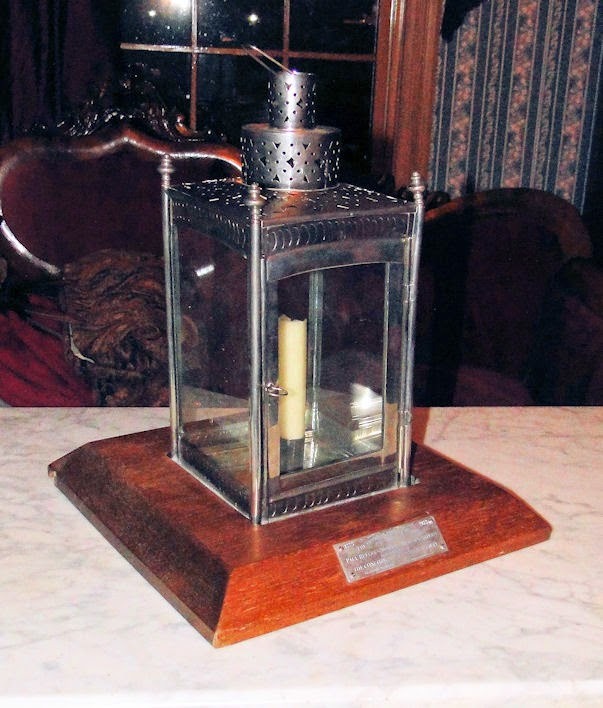 He obtained the lantern from Newman in 1782, and it's believed he recognized its historical importance. It remained in Brown's family until 1853, when it passed into the possession of Cummings E. Davis. Davis was a collector of old items - the kind of things most others didn't want to keep, in this case mostly colonial artifacts with local histories. 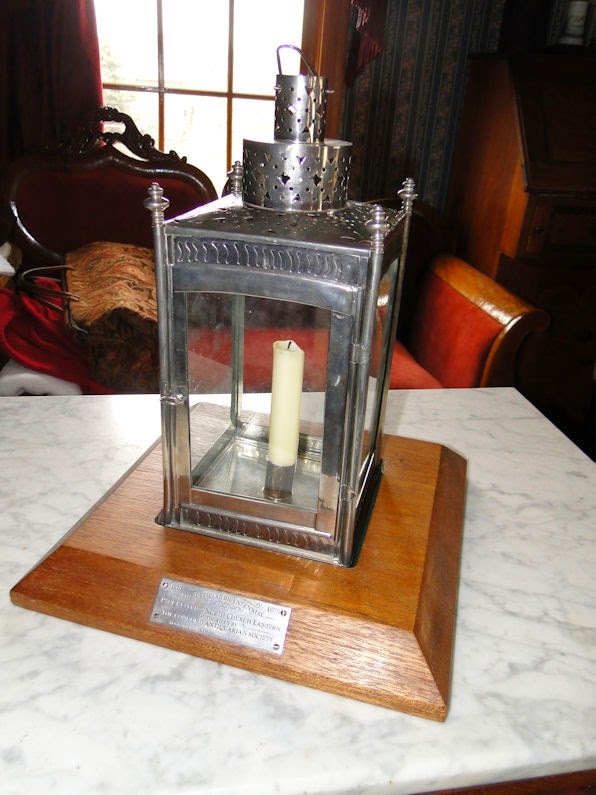 This hobby of his led to Davis, over time, acquiring what is now considered to be the first great collection of early American artifacts, including the Old North Church lantern from the descendants of Daniel Brown. The Davis collection became so large and attracted so much attention and interest that he began to devote all of his time maintaining and exhibiting it. In 1886, because of age, illness, and expense, Davis willingly gave up ownership of this amazing collection of Colonial America to the newly formed Concord Antiquarian Society, whose purpose was to preserve and exhibit the artifacts, which continues to this day as the Concord Museum. The most cherished of this collection? Why, the Old North Church lantern, of course! from the Saturday Evening post. I wanted the lantern so bad!! First, they were not individually hand-made by a craftsman, for this would have raised the price much higher than what was charged in 1975. Second, metals such as sterling silver and pewter were used instead of the impure sheet iron in which the originals were made. Again, this was due to cost as well as the fact that the old metals would rust over time, as has the original. 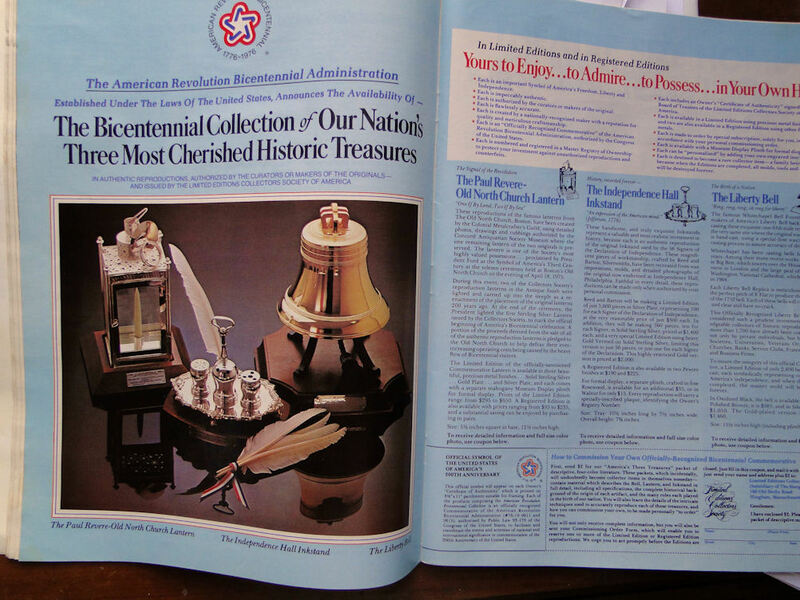 These Bicentennial lanterns were meant to be high-quality heirlooms...keepsakes. And, after searching all over the internet for quite sometime, I now own one of these replicas that are almost antiques themselves! 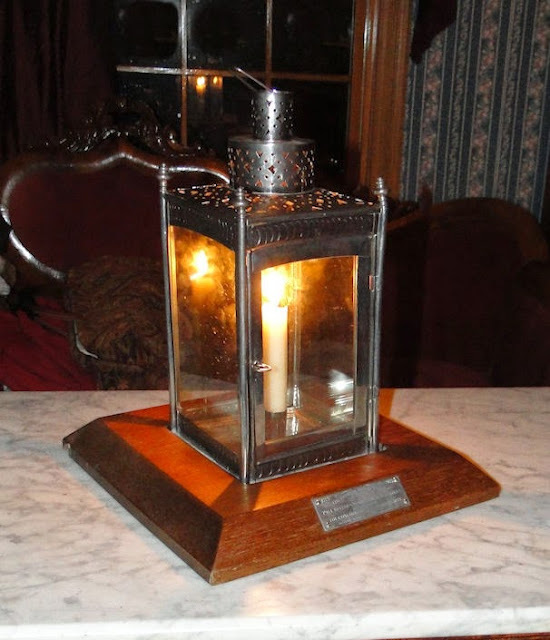 Considering it is now 40 years old, the lantern is nearly an antique itself! Combing the 'net, I would find the lanterns here and there, though not very often, and they would usually be priced way out of my reach. As cool as they were - and how badly I wanted one - I simply could not justify spending such a price. I contacted the person selling it and he told me that he was now in his 80's and since his children were uninterested he thought he'd sell it off and make a little money. The price was pretty darn cheap when compared to others I've seen, and I became excited. Maybe, finally, I might own one of these awesome replica lanterns! The seller also mentioned that a couple clips that held the glass were broken off and two panes of glass were missing as well. Because of this he gave me a better deal. I asked him why he was willing to part with the lantern after 40 years and he replied with, "My last birthday brought me to 83 and the realization that it's time to find new homes for some of my life's impulsive acquisitions. My children's interests lie elsewhere, negating them as the willful beneficiaries." Lucky for me, I suppose, but also kind of sad in a way. I certainly wish I had more of my own father's "impulsive acquisitions." But, to me, it was their loss, and now it is my unbelievable gain, and for that I'm thankful. Very much so, for I remembered the advertisements and thinking back then how great it would be to have something like this. Here is another photo of my recently purchased certified, meticulously reproduced copy of the Paul Revere/Old North Church Lantern. I added a couple other replicated period-correct items in this picture for effect. An unfortunate incident occurred during shipping: the lantern arrived without the round handle on the top, and the structure was also noticeably bent about a half inch off kilter, which made it wobbly. The gentleman I bought it from sent me a few photos before shipping so I know it wasn't from him. I made the attempt to contact and complain to UPS, but that proved to be far too tedious of a task. However, being a living historian has perks beyond what normal modern, 21st century people have: I time-travel, therefore I know people who can repair such an item as an 18th century lantern. In other words, I know "people from the past." It just so happened that I came across someone named Dennis Kutch while at a living history vendors show in Kalamazoo, Michigan. Dennis is the tinsmith at Kutch's Tinsmithing and Blacksmithing from Indiana (e-mail: dkltinker@gmail.com), specializing in handmade tinware. After explaining to him my situation, he asked me to bring the lantern in (I'm very glad I brought it along, "just in case"! ), and, after examining it, he was able to utilize his expertise and he straightened it out pretty darn good - close enough to perfect for me. 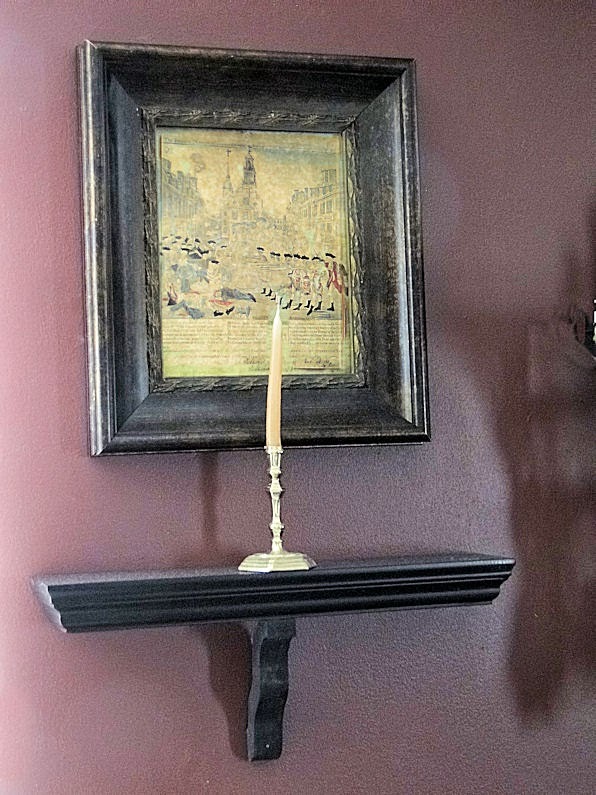 To show my appreciation, I purchased a colonial-era reproduction tin wall sconce from him. I mean, he didn't have to do what he did and I very much appreciate him taking the time to do it. Buying the sconce was the least I could do. The only thing left for me to take care of on the lantern was to make a couple of tiny clips to hold the glass in, which I easily did with tin that was being tossed out at the local hardware store. The same store cut a couple pieces of glass to size for the panes. And I can easily remove it from the plinth to take on presentations. For me, there's a distinct feeling of American Pride I get when I find items that pertain to our nation's wonderful history such as this lantern. I get a similar sense upon visiting historic places such as Greenfield Village, Crossroads Village, or Gettysburg (and I plan to visit Colonial Williamsburg, Boston, Philadelphia, and Old Sturbridge Village one day as well). I don't know...it's hard to explain, but, for all its good and bad (for we thrive on the good and learn from the bad), I have such pride in this country. Unfortunately, it's this American Pride that I have that seems to be missing in so many of our citizens in today's society, especially in modern youth. They're not taught to have high regard - heck, any regard - for our past but, instead, are taught to concentrate almost solely on the troubled parts of our history and look at the past with disdain. Pride and patriotism is now relegated to a political party. What a shame, for pride and patriotism belong to us all who are citizens of this great country. Well, contradictory to what seems to be taught in many places of higher learning (especially colleges), I personally try to see the good in our past, though I understand and accept the bad as well. I also try my best to see the times of long ago through the eyes, ears, and minds of those who were there and not through our modern biases, for we cannot judge the farmer, the banker, the post master, the cooper, the miller, the blacksmith, the silversmith, or anyone else from another time by our 21st century standards, but only on their own time's terms. I'm always on the look out for new-old items from the past to not only accent my living history presentations, but to have as part of my own home's decor and historic collection. I mentioned above that a Paul Revere sketching of the Boston Massacre is a conversation starter. And it's actually one of many such items - authentic and replicated - that start discussions. Like the Paul Revere/Old North Church lantern. One final shot of the lantern. Yeah...it's pretty cool alright! "Ken, Thank you for writing about this, as a descendent of several Revolutionary soldiers, as well as being related to both John and Samuel Adams, I found it inspirational, and I realized that I need to learn a great deal more about this time in our nation's history." Hey Ken, you make a great Paul Revere! That's great that you and your wife have history, reenactments and antiques in common. That was very interesting about the Lantern and that you can actually see the real thing in that museum. Go glad you got your replica. Thanks so much for visiting my Easter post and letting me know you enjoyed it. Did you happen to see my posts of Richard's historic home visit and the Ravenswood Mansion tour? I thought you might find those interesting. Take care and have a blessed Easter. I forgot to mention your "Father's Big Improvements" book, it made me laugh because it reminded me of The Beverly Hillbillies! Hey, I have a pair of these lanterns in wood bases marked sp 010 and sp011. Any idea what they are worth? We got them at an auction cause I liked them.